CLARINDA MAC LOW was brought up in the avant-garde arts scene that flourished in NYC during the 1960s and ‘70s. She began performing with her father Jackson Mac Low and with Meredith Monk at the age of 5. Mac Low started out working in dance and molecular biology in the late 1980s and now works in performance and installation, creating participatory installations and events that investigate social constructs and corporeal experience. Mac Low is co-founder and Executive Director of Culture Push, an experimental organization that links artistic practice and civic engagement, and co-curator of Works on Water, a triennial that supports art that works on, in or with water and waterways. . 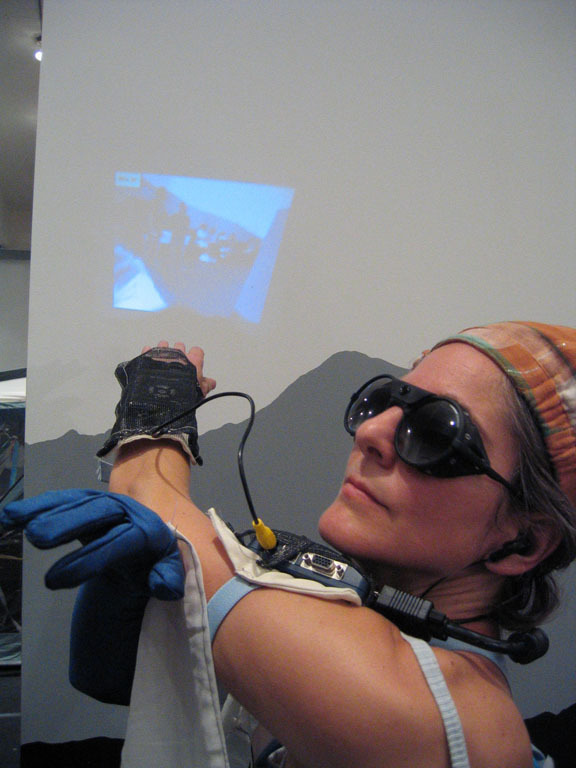 Her other work has appeared at Panoply Performance Laboratory, the EFA Project Space, P.S. 122, the Kitchen, X-Initiative, and many other places and spaces around New York City and elsewhere in the world, including the Manifesta Biennial in Spain. Recent work and ongoing projects include: “Incredible Witness,” a series of game-based participatory events looking at the sensory origins of empathy; “Free the Orphans,” a project that seeks to “free” copyright orphans (creative work with unknown copyright holders), investigating the spiritual and intellectual implications of intellectual property in a digital age; “The Year of Dance”, an anthropology of the NYC dance world that that examines how bonds form in art-making to create unconventional family and kinship structures; TRYST, performance interventions in urban space; “Cyborg Nation,” public conversation on the technological body and intimacy; and and “Salvage/Salvation,” a collaborative installation and performance project that explores the philosophical, emotional and material implications of re-use, discard, decay and abundance Residencies including as a MacDowell Fellow (2000, 2016), through the Society for Cultural Exchange in Pittsburgh (2007) and as a guest at Yaddo and Mount Tremper Arts (2012). She received a BAX Award in 2004, a Foundation for Contemporary Arts grant, 2007 and a 2010 Franklin Furnace Fund for Performance Art grant. Mac Low holds a BA, double major in Dance and Molecular Biology, from Wesleyan University and an MFA in Digital and Interdisciplinary Arts Practice from CCNY-CUNY. I create provisional communities of all kinds, working to generate situations where the viewer and viewed are mutually affecting, with experiences that wake up the body and mind. I explore hot subjects through a cool lens, using the scientific method to expose the ways we exist physically with each other, with technology, and with history, creating accessible mysteries designed to reach under the ribs and connect to the phantom organs of empathy and decisive action. My practice in multi-media dance and theater has gradually shifted, over the past decade, to a research-based practice. My work is still based in somatic practice, through involving the audience in an actively physical decision-making process, but I now create a variety of situations and environments, relying on a grab-bag of tools that emphasize the intangible, using installation, media (including video and sound), performance, dance and other physical action, directed wandering, technological mediation, unscripted conversation, and imaginative play. Collaboration and participation are cornerstones of my methodology and my work often blurs the line between curation and authorship. For my larger projects I bring many minds together to create around a single concept, weaving several independent strands of thought into a complex new fabric. In the end, “my” work is the work of many. I often re-frame our relationships to architectural space and urban public interactions, with interventions into everyday life and infiltrations into unexpected sites in a wide variety of communities, from the streets of the New York City Financial District and the Queens Botanical Garden to an abandoned church in Pittsburgh and a park in Siberia. I try to engage audiences in the context of their real lives, outside the black box and the white cube, and invite them to engage differently with each other and their surroundings. I believe that part of my job as an artist is to nurture other artists and encourage creativity in all different types of people, and I am committed to creating innovative dialogues across all creative disciplines. I do this through formal and informal teaching and mentoring, and through Culture Push, an organization I created with artists Arturo Vidich and Aki Sasamoto. Culture Push runs programs that encourage participation and face to face interaction as an integral part of an ongoing cultural dialogue.